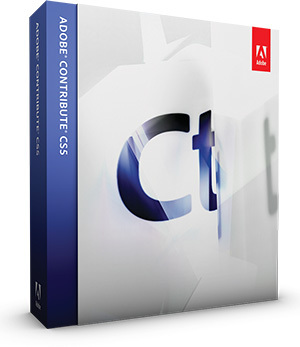 Contribute CS5 Now Available For Instant Download! Adobe® Contribute® CS5 enables users to quickly create and edit web pages collaboratively in an easy-to-use WYSIWYG HTML editor, without writing code. New features include native XML file editing, image hotspot definition, cross-browser preview and compare, Spry widget editing, Server Side Includes (SSI) file editing, and advanced search and replace. Its in-browser editing environment gives content authors the capability to drag and drop FLV, SWF, and PDF files directly into pages, as well as advanced text- and image-editing tools. Managers can encour­age creative web development while easily controlling workflow, review and version processes to produce static or dynamic websites with one-click publishing. Predefined content types – Create new pages quickly based on existing design templates and page functionality. Set the workflow to hold new pages for review or to have them go live instantly. Set auto­matic expiration dates for new content. XML file editing – Edit site-associated XML content natively, without having to leave Contribute and open an XML editor. Easily update Spry data sets and other pages that render content from dynamic XML-based sites by editing the corre­sponding XML file. Cross-browser preview – Verify the look and feel of updated pages in multiple browsers. Preview edited pages in any installed browser. Windows® users can view three browsers simultaneously with synchronous navigation and crawling for side-by-side comparison. Spry widget editing – Edit any content contained in a variety of Spry widgets, including data within accordion, tabbed, and collaps­ible panels. Change properties such as panel transition animation effects. Collaborative publishing – Establish collaborative workflow processes to author, review, and publish content. Define different review paths, whether a single approval for an internal page or multiple sign-offs for a public page. Enable multiple reviewers to comment on drafts simultaneously with in-context tools for faster and more effective web publishing cycles. Multiple page search and replace – Use the enhanced search and replace capability to update information on multiple open draft pages. Streamline the update process by performing in minutes a previously tedious task. Subversion support – Roll back pages to previously archived files using the built-in Contribute rollback feature or Subversion, which is supported by Contribute CS5. Dynamic website editing – Add content to dynamic websites powered by Movable Type, TypePad, or WordPress. Simply define the Contribute connection with the proper settings, and site content is instantly available for updating. Image hotspot support – Create multiple links to different parts of a single image with integrated WYSIWYG hotspot support. Draw one or more hotspots onto any image, and then add alternative text and URLs for immediate interactivity. SWF or FLV file embedding – Insert SWF or FLV files, and Contribute creates web standards-compliant code, compatible with that created in Adobe Dreamweaver® software. This helps ensure that content is Adobe Flash® Player compatible while enabling drag-and- drop authoring in Contribute. Server Side Includes file editing – Allow authors to edit Server Side Includes (SSI) files. Authors can choose SSI files from a list, without needing to know the file path. Modify HTML content in the SSI file with Contribute. Text and image enhancements – Create superscript and subscript text directly in Contribute. Rescale, rotate, crop, and sharpen images, and adjust their brightness and contrast. Changes are displayed accurately with enhanced CSS rendering. Publish to websites and blogs – Publish with a single click to a wide variety of websites or blogs. Contribute is the one web authoring tool that supports FTP, SFTP, WebDAV, Meta­Weblog, and Atom protocols. The CS5 Product Matrix and CS5 Price Sheet. Or, download a free trial.